Bathrooms can easily become quite mundane in our homes. They are usually the last place we think to add something lovely just for ourselves. Here is a simple idea with great results. I bought this white cane basket from our local secondhand store for a few dollars. I rolled my towels up and neatly placed them inside. The basket it's right near the shower door so now every time I feel like a fresh towel I simply reach down and grab one. 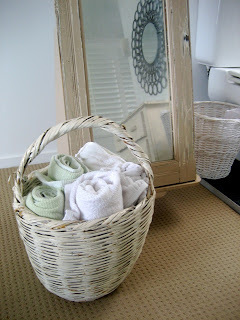 I splurged on some special fabric softener to make the towels that little bit more devine. Why not try something like this in your bathroom today. I guarantee it will make the space more cosy and inviting. I am off to the beach with my family until mid next week. Have a great weekend. 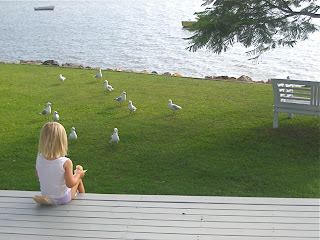 One morning last week after breakfast I found my 3 year old sitting on the back deck feeding the seagulls. I grabbed my camera and took this shot. While my husband and I hastily went about our morning routine, she decided it would be best just to grab some bread and sit down with the birds. For few seconds I stopped and watched her. How wonderful to be a child. I was reminded once again that some of my most inspirational thoughts have come from just being still and observing. This weekend I will take some time for myself to so this. I hope you can do the same. 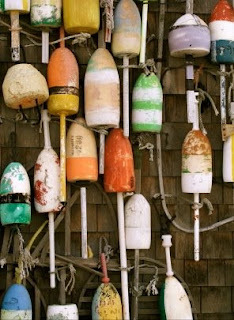 I am fascinated by Cape Cod. I have never been but there's just something the place that captivates me. I guess if I had to pinpoint something it would have to be the architecture of the homes and the furnishings inside them. I love the decorating style used. Simple. Soft colours. 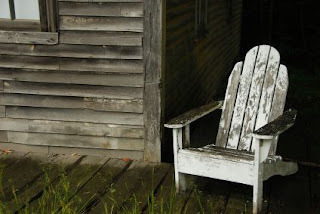 Weathered furniture. Nothing too modern. I look forward to someday visiting this lovely place. Are you drawn to a certain location you are yet to visit? Maybe that place says something about your own personal style. So put it on your wish list. 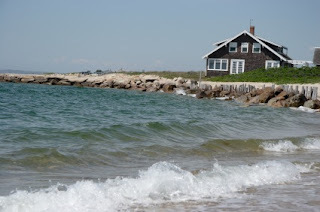 I know I have Cape Cod on mine. 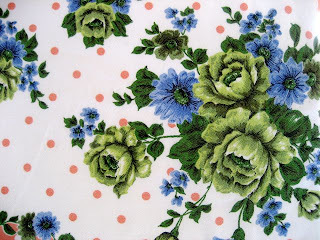 I am loving vintage tablecloths at the moment. 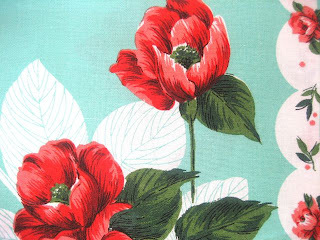 My favourite is anything floral. Here are a few photo's from my (ever growing) collection. 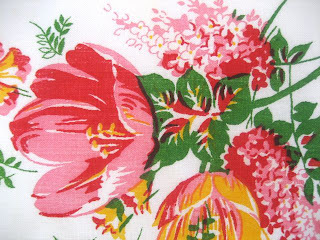 I truly believe the designs and prints are timeless. You can pick one up quite cheap on Ebay or at second hand stores. 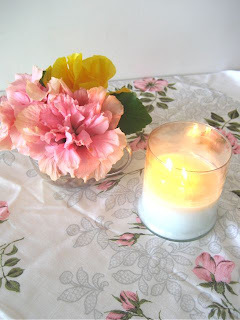 Splashed over my dining room table with a candle & a few flowers really picks up my mood. Afternoon tea anyone? 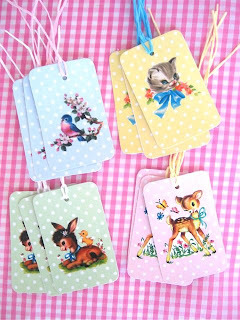 I couldn't resist buying these vintage inspired gift tags from Lark Australia. Each tag has an illustration from a vintage children's book or card. They are so fun and quirky. I can't wait to buy gifts just so I can use them. As a child I had almost every golden book published! These cards remind me how much I adored and cherished them. My mother has kept most of them to pass on to her grand children. I think it's time I got them out. Just the smell from an open page of a Golden Book will bring back a million memories. How glorious! 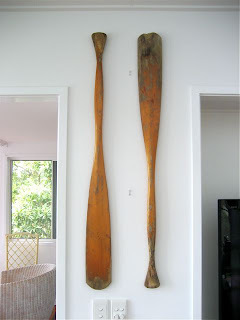 When I saw these old weathered vintage oars for sale on Ebay I couldn't resist them. I drilled small holes in the back of each one and mounted them on nails to my living room wall. One of them is more worn than the other and every time I look at them I wonder why. Was one used more to push away at rocks ? Or was there an accident that caused the damage? Whatever it was I am glad I own them as they are one of my favourite items at home. You can easily re create this look. Just search "oars" on Ebay. You can also pick new ones up at selected marine stores ( and then rough them up ). It's such a simple thing to do. If you don't wish to mount them on your wall you can always just place them in a corner somewhere (see yesterday's post). Have a great weekend and I will be back on Monday. These colours work so well for me. Shades of blues mixed with white create such a relaxed and cosy feeling. It is instant. 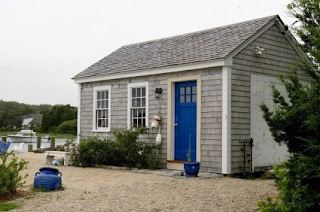 Do you have a small area at home where you could create such a place? 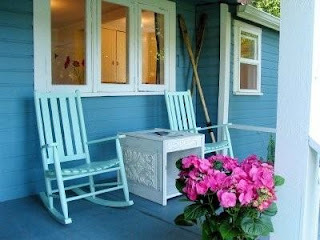 All you need is a couple of old chairs and a pot of flowers. It doesn't have to be outside either. Even a small corner or an unused side wall. Notice the oars in the corner? I recently purchased some for my own home. Stay tuned for tomorrows "project day" when I will show you what I have done with them and how you can do the same. Sometimes just mixing a few simple things can make such a statement. 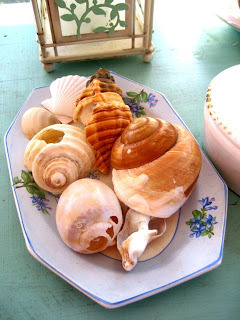 Over the years I have collected many shells from our trips away to the beach. I decided to place a few of them on a vintage serving plate I picked up at a garage sale recently. The plate is a little rough in places from years of use, but I think it works perfectly with the shells. 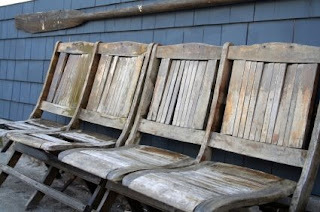 They too are a little chipped and imperfect, succumbing to years of battering by the sea. So now I can see my beautiful shells every morning before I grab my keys and head out the door. I am reminded of all the lovely beaches I have visited (and fallen for). 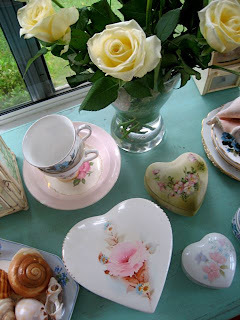 Do you have some special trinkets hiding away that should be on display?